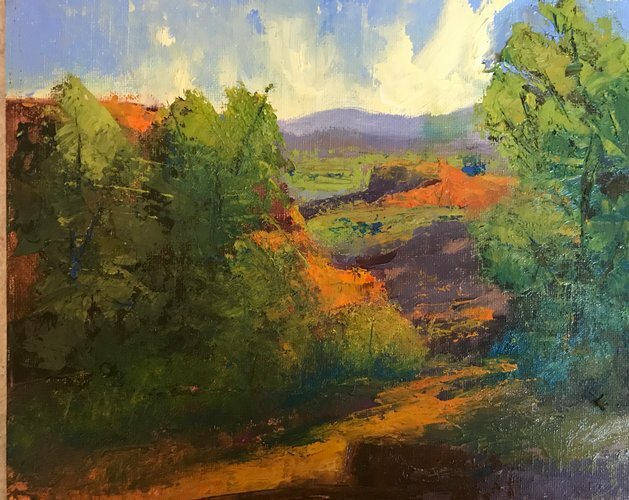 Plein Air Artists of Colorado Annual Juried Members Exhibitions. 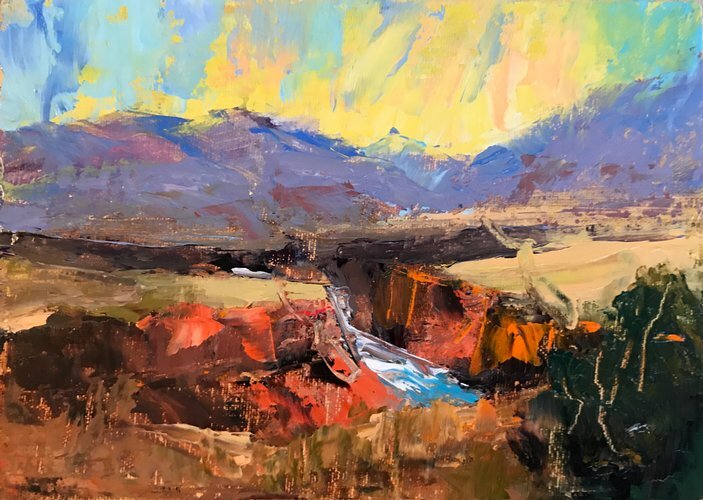 Return to the Rivers Exhibition: MARIGOLD Arts Gallery Canyon Road. Opening:May 6, 2016. Biologique: NM Art League Exhibit. Oct - Nov 2015. Las Campanas Annual Community Fund Silent Auctions. 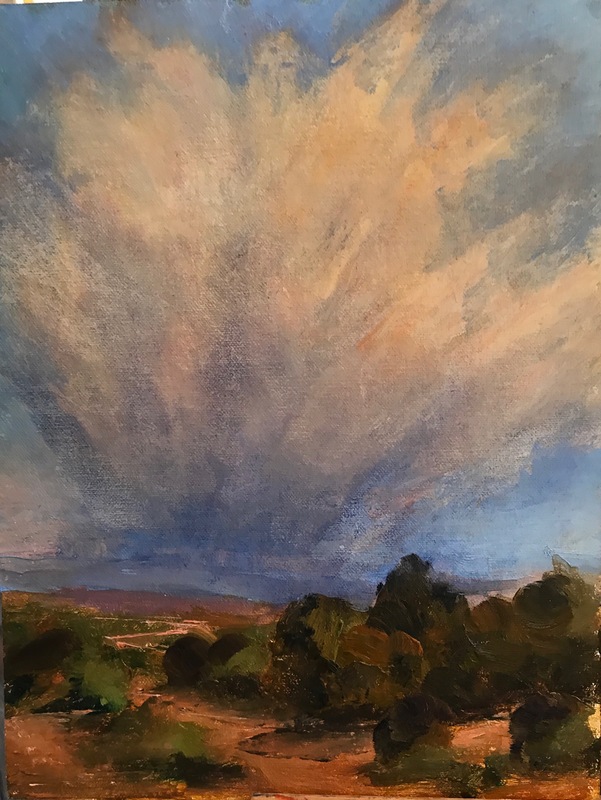 Saturday, June 30, 2018 4:30-6:30 pm. At the Marigold Arts Gallery on Canyon Road: www.marigoldarts.com. Sold Apr 22, 2019. Gift to my son. 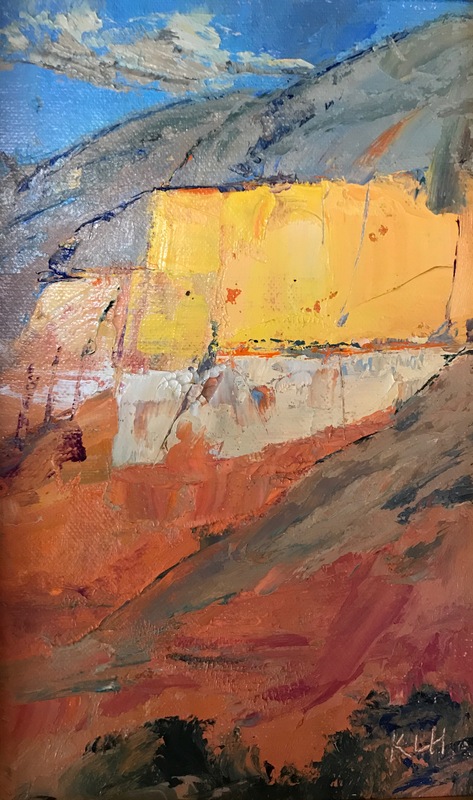 Studio work based on the Santa Fe Turbulence award winning painting. Holiday gift for a friend. Holiday Gift December 2018 based on several larger versions. 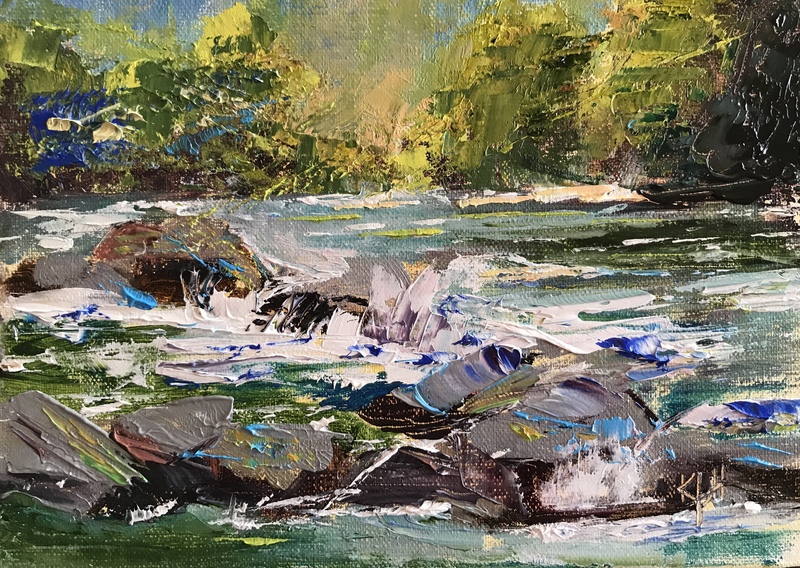 Holiday Gift December 2018 for my son based on several works painted by the river. 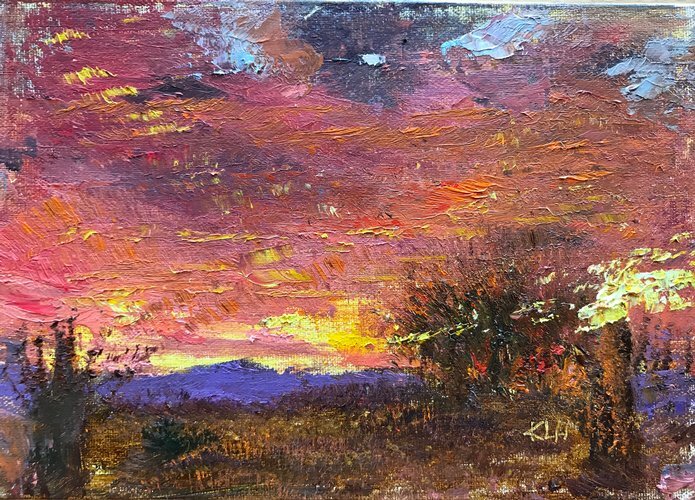 Painted as a holiday gift from a photo of a magnificent sunset in Arizona in Dec 2018. 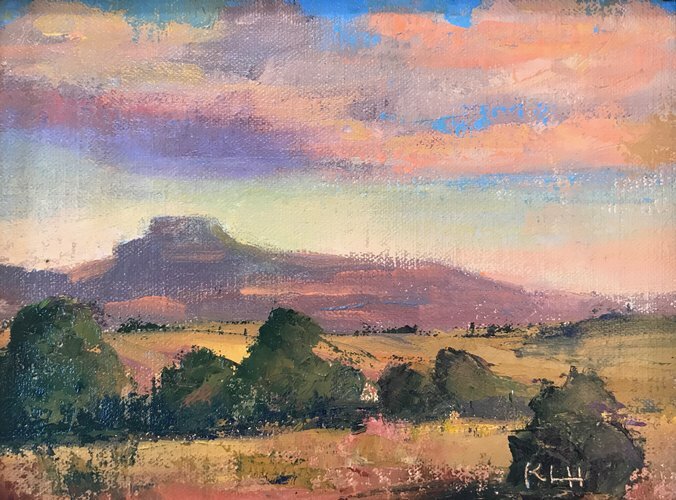 Painted during the 2018 Los Alamos Fall Paintout and Show sponsored by the Plein Air Painters of New Mexico. Exhibited until Oct 6 at the Fuller Art Center in Los Alamos and available for sale. NFS but willing to commission a similar painting. 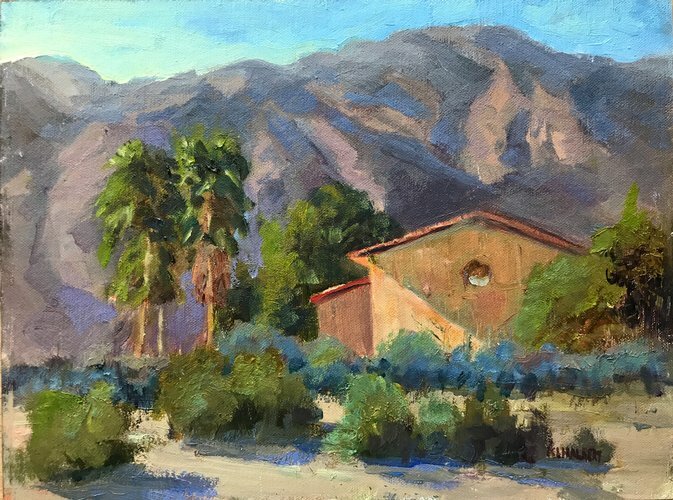 "En plein air" in Borrego Springs, a small, established resort town 60 miles east of San Diego (90 miles south of Palm Desert). Inquiries: karen.halbert@gmail.com. 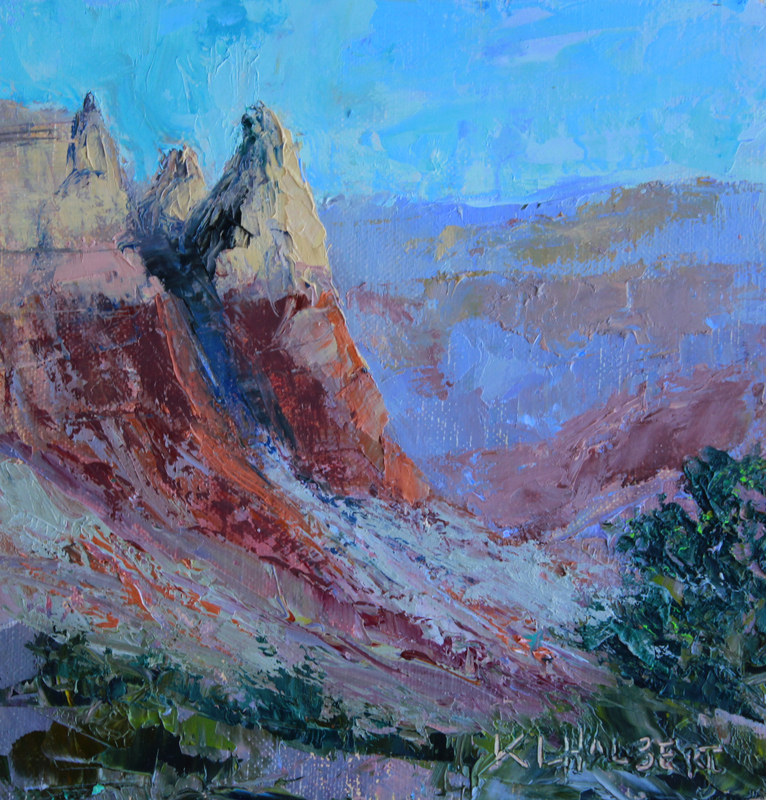 Painted in the studio from a cropped photograph of the Chama Cliffs near Ghost Ranch. 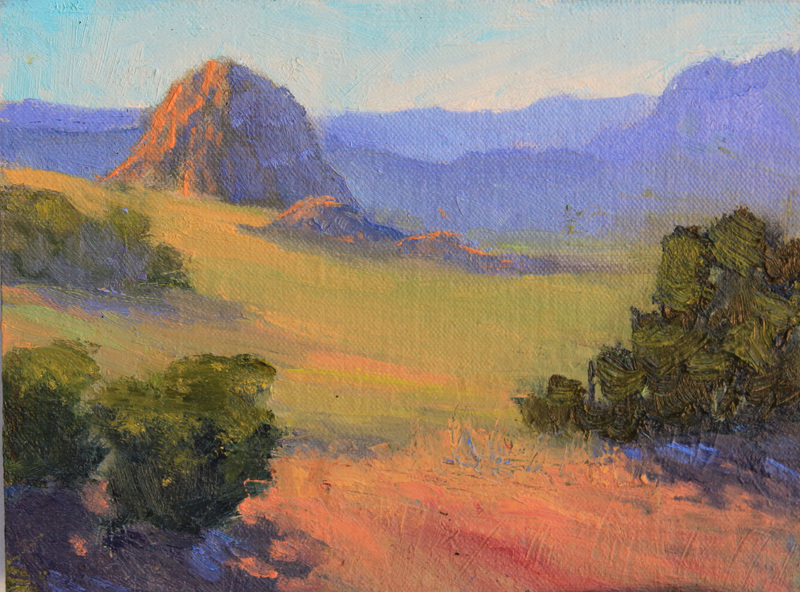 Also from a Plein Air painting. "En plein air" in Borrego Springs, a small, established resort town 60 miles west of San Diego (90 miles south of Palm Desert). To get there I drove through a pass in the mountains in a snowstorm!! Fortunately the 3000 foot elevation of the town led to nice painting weather. Beautiful scenes in all directions. Inquiries: karen.halbert@gmail.com. 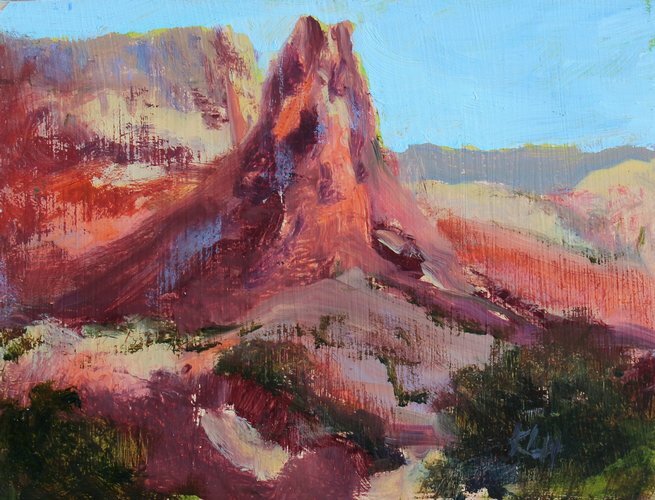 Inspired by the Pedernal, the mesa Georgia called "her own". 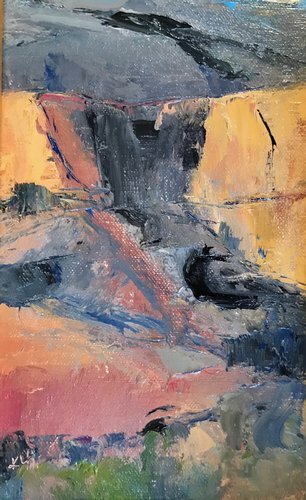 Palette knife. First in a planned series of this iconic mesa. Inquiries: karen.halbert@gmail.com. 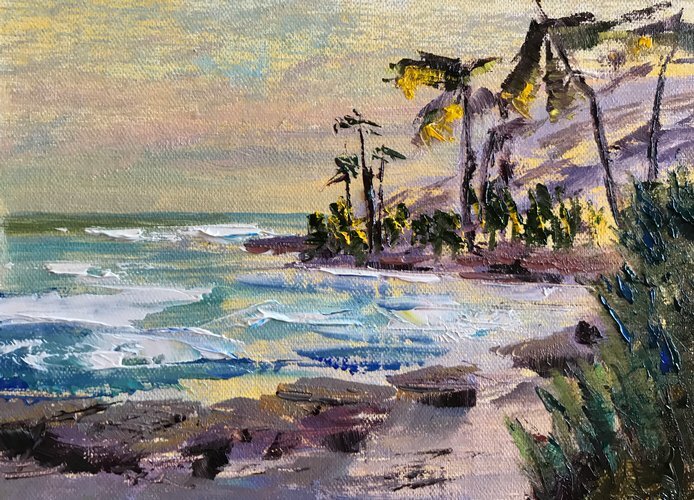 "En plein air" at sunset.Inquiries: karen.halbert@gmail.com. 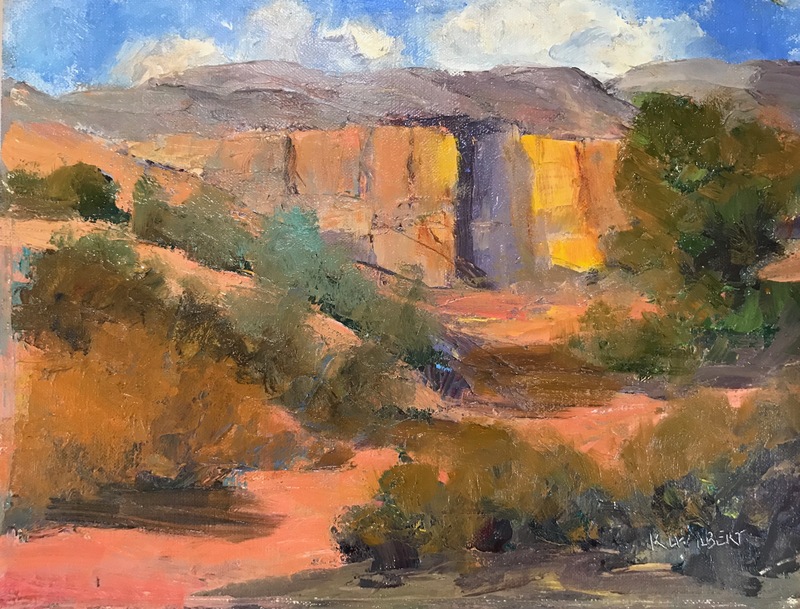 "En plein air" at the Yellow Cliffs off Monastery Road just north of Ghost Ranch. 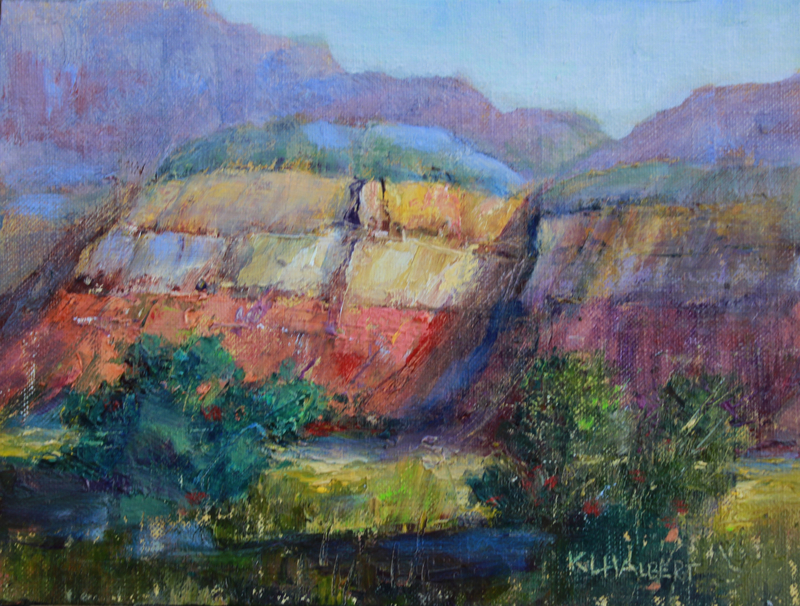 Painted along with the Yellow Cliffs of New Mexico II. Golden rectangle proportion. Sold 3/2019 by the Marigold Arts Gallery, www.marigoldarts.com, on Canyon Road in Santa Fe. 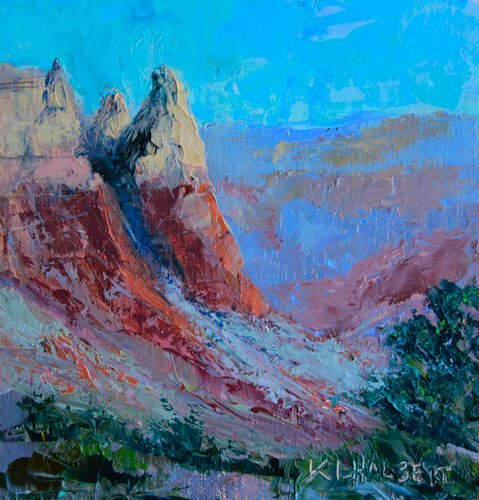 "En plein air" at the Yellow Cliffs off Monastery Road just north of Ghost Ranch. 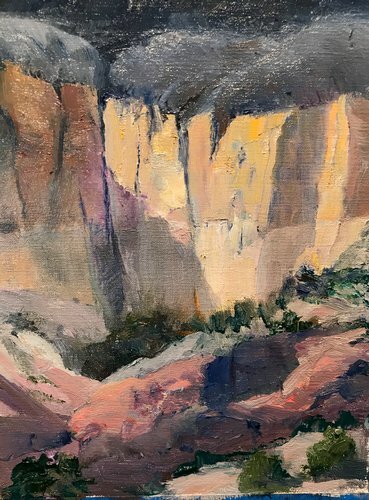 Painted along with the Yellow Cliffs of New Mexico I. Golden rectangle proportion. 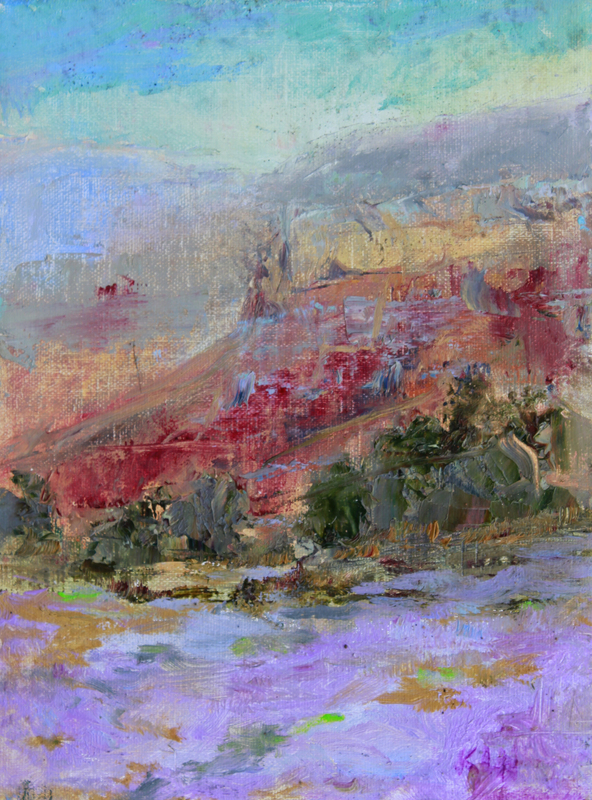 Available at the marigold arts gallery, www.marigoldarts.com, on Canyon Road in Santa Fe. 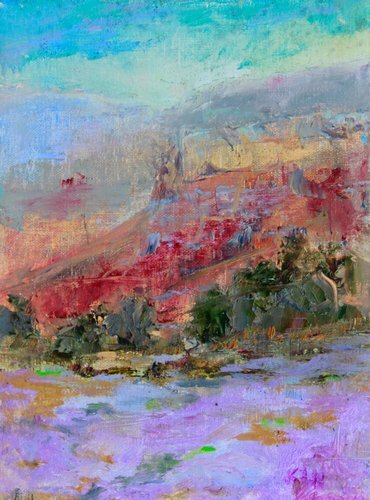 "En plein air" at the Yellow Cliffs off Monastery Road north of Ghost Ranch. 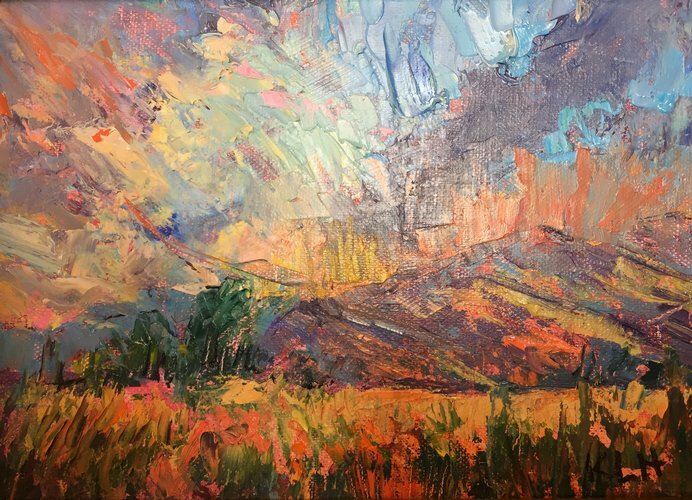 Available at the marigold arts gallery, www.marigoldarts.com, on Canyon Road in Santa Fe. At the Marigold Arts Gallery on Canyon Road. 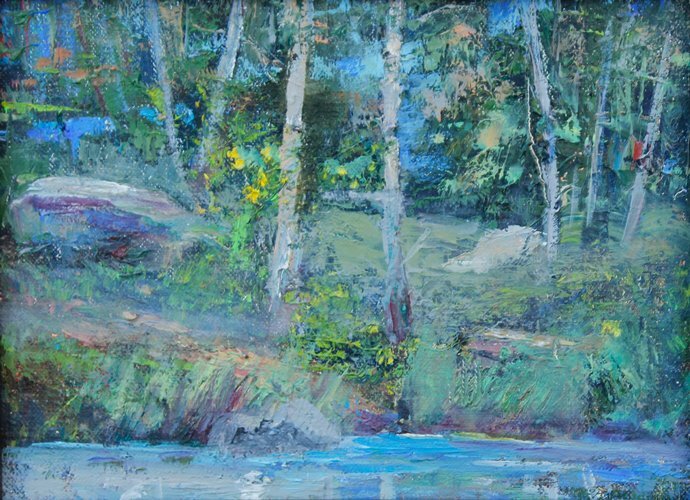 Forerunner of the other "woodland" paintings.. I think that my love of the woods comes through in this painting. This was up at the Big Tesuque Campgrou 2017nd near the Santa Fe Ski slope. No, I no longer camp out, but it was tempting. 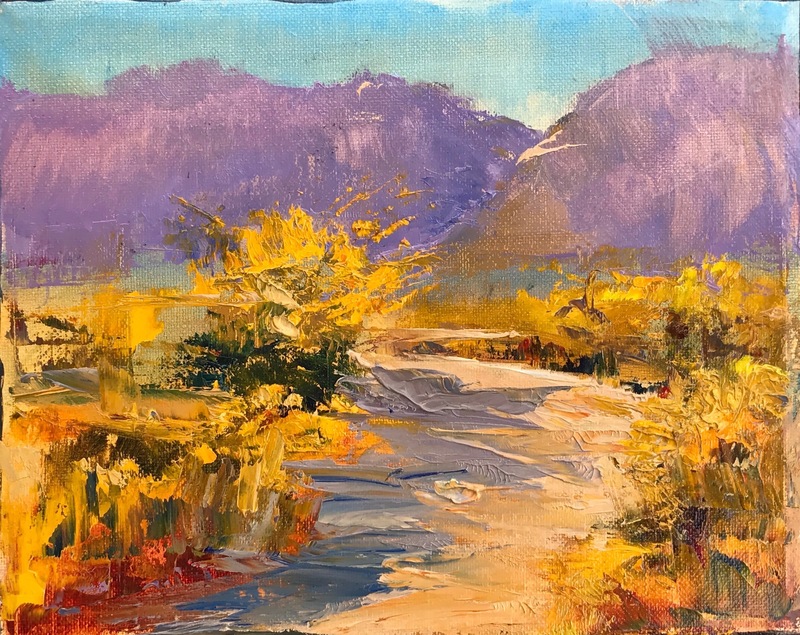 Sold June 16, 2017 by the Marigold Arts Gallery on Canyon Road, http://www.marigoldarts.com. This is the first painting of the "Return to the Rivers" series at the Tesuque Aspen stream (not really a river). 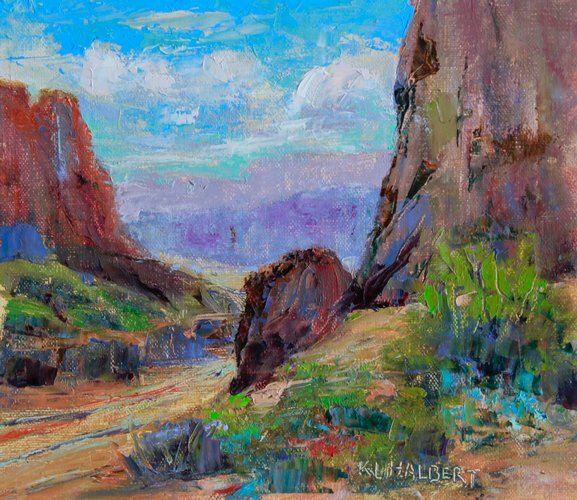 "En plein air" overlooking the Elephant's Head landmark at Madera Canyon, Green Valley, Arizona. 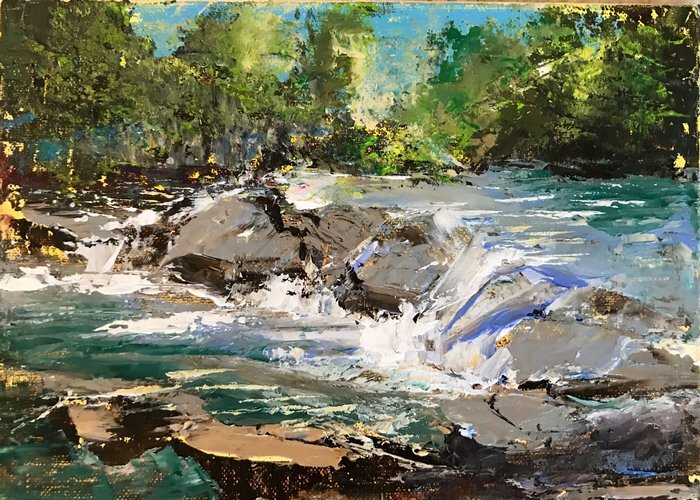 Painted on my first painting trip to Green Valley Inquiries: karen.halbert@gmail.com. Small, more colorful version of painting done "en plein air" of the cliffs from Monastery Road near Ghost Ranch ("Chama Striations"). In a floating frame. Sold at the Purple Sage Gallery, www.purplesagegaleria.com. 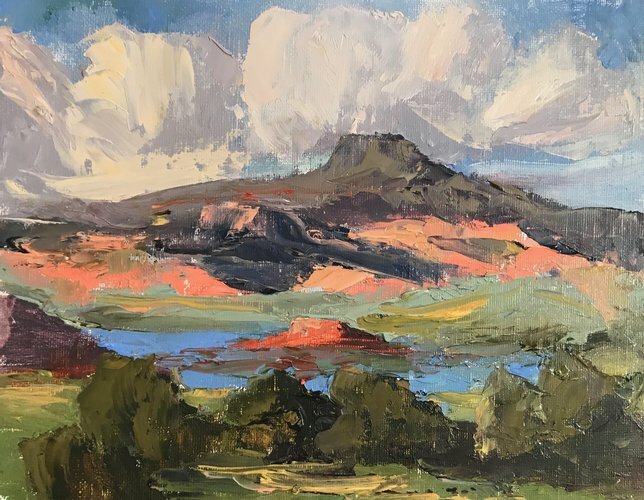 Small studio work version of somewhat larger (10x8) plein air piece .Sold by the Purple Sage Gallery, www.purplesagegaleria.com.